Mother’s Day is a day to celebrate not only Mom (who is the one who gets the gifts), but the whole family (without whom there would be no reason to celebrate Mother’s Day). Some women consider Mother’s Day a time for pampering and relaxing. If that’s the case, she might enjoy a massage, a trip to the spa, a manicure/pedicure, or a girls-only outing of some sorts. If you have family that lives nearby, then you’ll might want to organize a get-together with the rest of the crew. (Then again, you might want to start thinking of excuses now as to why you can’t get together with the in-laws). 1. Picnic – My whole family has always enjoyed picnics. You can go to a favorite park or to the beach or lake. It’s a great way to spend time together. You can pick up sub sandwiches to go, or pick up a feast at your favorite deli. And don’t think that picnics are only for lunch or dinner – my kids absolutely loved breakfast picnics! It’s a delightful way to enjoy the great outdoors before it gets too hot outside. 2. Swimming – If it’s warm enough for the pool, beach or lake, swimming is a fun family activity. Be sure to give Mom extra time for reading while lying in the sun! 3. Gardening – Today is a wonderful time to add a few bushes or plants to the garden. Or visit your local botanical gardens – a great place for a picnic! 4. Baseball Game – Go check out your favorite team. Be sure to bring along the peanuts and Cracker Jack! 5. Zoo – An outing that the whole family will enjoy. And since it’s spring, there might even be baby animals to Oooh and Ahhhh over. 6. Hike – Take a scenic walk along a favorite path, or try some place new. 7. Play laser tag – What’s more fun than make-believe warfare with your loved ones? An especially good choice for a rainy day! 8. Golf – Either full-size or mini-golf depending upon what your family prefers. 9. 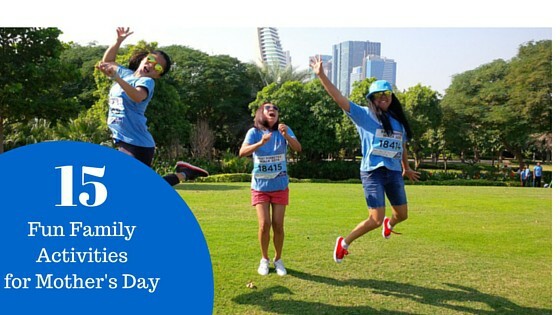 Run a Mother’s Day race together – Because the family that runs together, stays together. 10. Play games together – Cards, video or board games…Mother’s Day is a great time to try a new game or just play the old favorites. 11. Sing by the firepit – or make s’mores (better yet, do both)! 12. Play an old-fashioned summer sport such as badminton or croquet. 13. Go on a family bike ride – bonus points if you end up at an ice cream parlor! 14. Make home-made ice cream – let Mom pick the flavor! Click here to get 35 delicious home-made ice cream recipes from Southern Living. 15. Go indoor skydiving together – a Mother’s Day experience the whole family will remember! Be sure to check your local listings for fun events that are going on in your area…there’s usually quite a few special events scheduled in honor of Mother’s Day! Twitter is actually a good place to get suggestions. Just search for your hometown name.